(Newser) – It's been a banner year for women at the Olympics, with the presence of two female Saudi Arabian athletes getting the lion's share of attention—until yesterday. 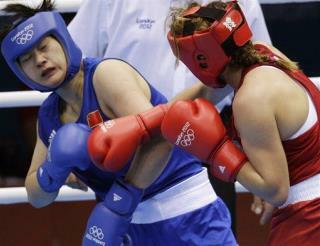 Sunday marked the death of the Games' last male-only sport: boxing. The day saw a dozen fights, a number of them "thrilling," in the New York Times' telling. Just 36 slots in three classes—flyweight (112 pounds), lightweight (132), and middleweight (165)—were made available, and with some boxers drawing a bye in the first round, it's a short path to a medal. How does involvement of females kills male-only sport? It's not like males are fighting females. I'm a feminist, so why aren't I aren't I applauding this news? Because it's a sport whose sole barbaric purpose is to hit and hurt opponents. At least fencing, which also involves deliberate striking, has evolved protective gear to prevent serious injury. Now men just need to break into synchronized swimming!